Back in mid-August, we caught wind of a device from Motorola under the codename “quark” that appeared to be on its way to Verizon. The device was thought to have incredible specs, thanks to a benchmark, which showed a QHD screen resolution (2560×1440), Qualcomm Snapdragon 805 processor clocked at 2.65GHz, Adreno 420 GPU, 3GB RAM, and Android 4.4.4. I can confirm this morning that the device is indeed real, is headed to Verizon, likely as the next DROID, and may have some extra tricks up its sleeves that we had not yet heard, at least according to recently filed FCC documents. So here is what we know as of today. A Motorola device under FCC ID IHDT56PK1 popped up last night. 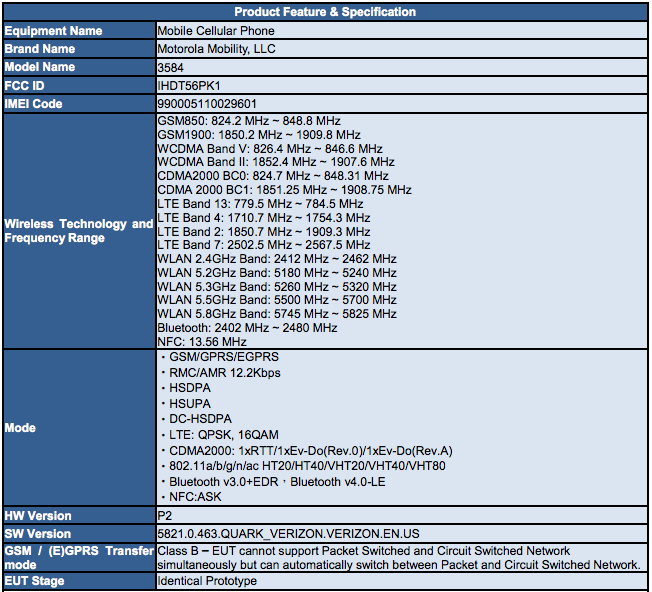 The device sports all of Verizon’s wireless bands, from CDMA2000 to LTE bands 4 and 13. It also includes global roaming GSM bands of 850 and 1900, like all Big Red phones do these days. To fully confirm that this is the “quark,” though, look no further than the image below, which lays out the product’s features and specifications. In the software version section, it clearly states “5821.0.463.QUARK_VERIZON.EN.US.” Yep, this is the new Motorola device headed for Verizon. As you would expect, it also features WiFi 802.11a/b/g/n/ac, NFC, and Bluetooth 4.0. After digging through additional documents, we also found mention of Motorola’s new Turbo Charger, which can fill up the new Moto X with 8 hours of battery life in just 15 minutes. The mention of Turbo Charger is significant because the @DroidLanding account that reactivated last week, has been spitting teasers for a new DROID phone, one that will include faster charging. A potential device name of “DROID TURBO” has also been tossed around in rumors. We even saw a mention of a wireless charger setup, so there is a good chance that this new DROID will also feature wireless charging, something the new Moto X lacks. We should also point out that this new DROID “quark” is slightly bigger than the new Moto X. The device’s measurements show that it is 73.33mm wide and 143.49mm tall, with a diagonal corner-to-corner measurement of 154.49mm. 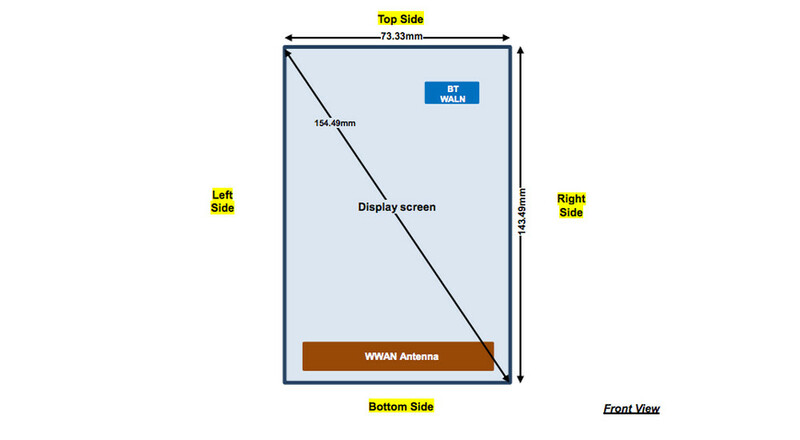 The new Moto X is 72.6mm wide and 140.36mm tall, with a diagonal corner-to-corner measurement of 149.34mm. On a battery front, the device sports a battery with a model number of EQ40. For reference, the original DROID MAXX used a battery of EU40, which weighed in at 3,500mAh. This is looking more and more like the new DROID MAXX. The FCC documents do not list out the processor, RAM, or camera. There you have it. The new DROID “quark” is on the way. Thursday Poll: Should a Smartwatch be Round or Square?